The shield includes the very popular DS1307 battery backed real time clock (RTC). This RTC will keep an accurate track of the data and time for up to several years, even when then shield isn't being powered. A standard SD card reader is provided to allow FAT16 or FAT32 formatted SD cards up to 32GB in size to be read or written to and is compatible with the standard SD card library. The shield also contains appropriate level shifting circuitry to protect the 3.3V interface of your SD card. A very useful protoyping area consisting of a grid of pads on a standard 0.1" pitch provide an area to add your own components such as sensors to interface to your Arduino board. 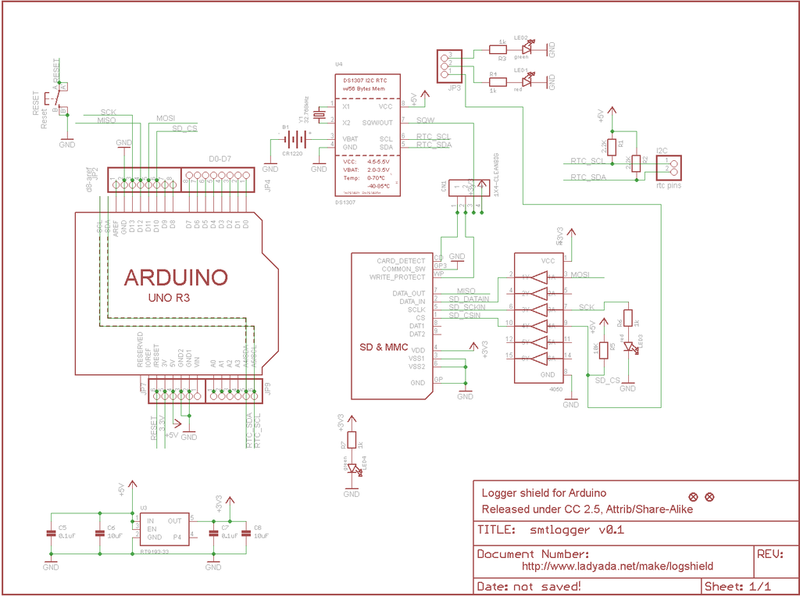 Two additional LEDs have been added which can be mapped to any of your Arduino's digital pins for use as visual indicators. The shield has a standard set of Arduino headers allowing additional compatible shields to be stacked. This product is manufactured by Deek-Robot and is derived from the Adafruit(TM) Data logger reference design which was released under the Creative commons Attribution-ShareAlike 3.0 licence http://creativecommons.org/licenses/by-sa/3.0/. be loaded into a spreadsheet such as Excel or Open Office. /* Use the RTCWrite library function to set the time and date. /* Open the data.csv file to save our data to. For the I2C interface (used by the RTC) you'll need to link the pads marked SCL and SDA (next to the LEDs marked L1 & L2) across to the similarly marked pads on the opposite corner of the shield (near the analogue header). Keep in mind when you do this you are effectively shorting the analogue pins A4 and A5 to pins 20 & 21 on your Mega. If you can guarantee that you wont configure these pins as digital outputs at any point whilst the shield is connected then you should be safe. Otherwise you'll need to disconnect the header pins that plug into the A4 and A5 socket on your Mega. For the SPI interface (used by the SD card reader) you'll need to wire across the Mega's SPI interface (available on digital pins 50, 51, & 52 or via the 6 pin ICSP header) to digital pins 11, 12, & 13 on the shield. You can also use the prototyping pads near the header for this. As with the I2C interface you'll want to with bend out the digital pins 11, 12, & 13 on the shield so that they don't plug into the socket on your Mega, or just cut the tracks on the underside of the board that run between the header pin and its prototyping pad. hi wired as said but when runnning the program it locks at //HCRTC.RTCWrite(I2CDS1307Add, 15, 2, 24, 14, 21, 0, 2); i // this line reload then it says ERROR: SD card failed to initialise tried cs on pin 53 still same any more ideas ? Can you give this sketch below a try. If you open up the serial monitor window you should see the time tick up once a second. module that uses a DS1307 device. There is a connection between pin 21 (SCL) on your mega and the SCL pad on your shield. That analogue pins 4 and 5 on your mega are not connected to the shield. That's great. You should be able to leave it on pin 10 but it's wise to configure pin 53 as an output. This stops the hardware SPI interface from being accidently switched to slave mode by RF noise and locking up the SPI interface.